We pride ourselves on making your move stress free. Right from the first point of contact, one of our team will come and survey your property free of charge and explain exactly how we would do your move we send email or written quotations. We offer a full packing and un-packing service if required, or we will simply supply all your packing materials so you can pack yourselves. We can also arrange competitive storage facilities with CCTV security and 24 hour access. We also give free goods in transit insurance and a pensioner discount and NO VAT. We pride ourselves on total care to your belongings with being a family run business we ensure you are treated as part of the family with a 100% reliability record. Our professional team are friendly, courteous and provide an excellent customer service always putting our customers first. Your move day is a very important one and we always consider this and make sure that communication and consideration are high on our list. 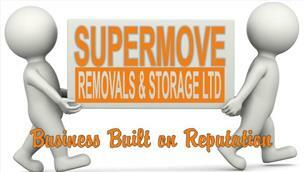 Supermove Removals offer a very professional packing service, our packing service is normally done the day before your move. A huge benefit of the packing service is you can live as normal in your house without all that packing to do yourself and falling over all those boxes.